King salmon is so called for a reason. It is the largest salmon in the world and is known to be the best-tasting. King salmon is also called the chinook salmon. 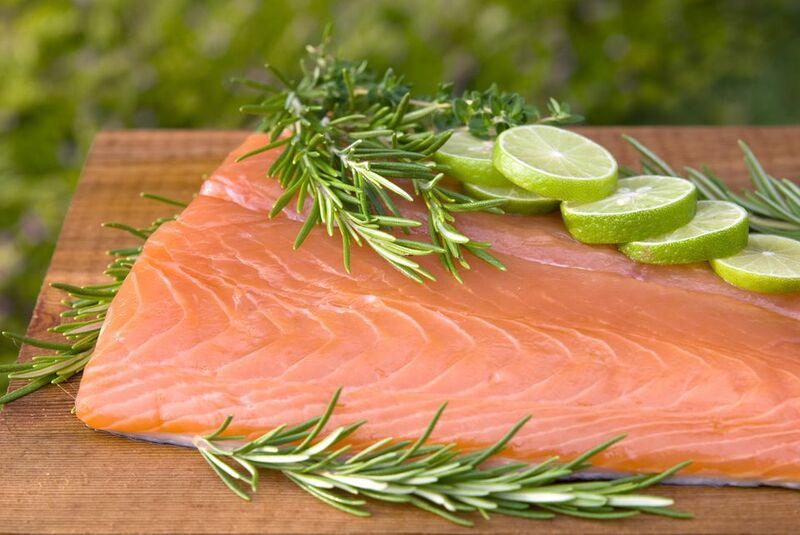 A king salmon can grow well over 100 pounds and can vary wildly in flavor. King salmon are native to the North Pacific Ocean and can be found in the rivers of western North America, all the way between California and Alaska. King salmon can also be found in northern Japan and other Asian rivers. From a flavor perspective, ocean-caught fish are the finest flavored. At their best, king salmon are a blinding chrome on the outside, with meat that is a vibrant orange inside. So-called "bright" salmon caught in rivers are also good for eating, but once the fish begin to turn dark or, even worse, red, they rapidly become useless for all but pet food; the meat becomes watery, mushy and tasteless, often with an undertone of mud. A wild, ocean-caught or even a bright river-caught salmon will always taste better than a farm-raised salmon. But a farm-raised fish will surpass a poor quality river fish and are often fattier. Remember that all farmed salmon are Atlantic salmon, which is a different species from the king salmon. You must assume every salmon you see in the market that is listed just as "salmon" will be farm-raised. Wild fish command higher prices and will be advertised as such. There are numerous environmental concerns over farm raising salmon, so be sure to choose wisely and talk to your fishmonger about any questions. Another option is to order fresh salmon by mail order. If you do not live in the Pacific Northwest, the king salmon's natural habitat, this is likely the easiest way to buy king salmon. The salmon is flash-frozen as soon as it's caught. This helps to preserve its freshness and allows for easy shipping. From a cooking standpoint, king salmon are extremely versatile. They are loaded with omega-3 fatty acids, and that fat makes a king salmon very forgiving to a novice cook. Salmon fat can be so creamy that a sushi-grade salmon belly is considered on par with the delicacy of sushi-grade tuna belly. Every part of a chinook, or king salmon, lends itself to grilling, slow barbecuing and especially the even slower process of smoking. The fat found in king salmon is also salmon's enemy, as it goes rancid fast. Even the best frozen fish will not keep at its prime condition in a home freezer more than three months. If you find yourself with more salmon than you can eat in that time, make friends and give some away or get cooking! Here is a final, somewhat unexpected tip about salmon skin: don't waste it. Once it's been scaled, salmon skin crisps up beautifully and can be served as the fishy equivalent of chicharrones, or deep-fried pork rinds. Crispy salmon skin is a treat not to be missed.